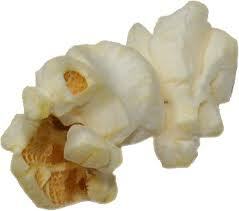 Plain popcorn has twice as many polyphenols as fruit. Polyphenols are antioxidants found in plants that help counter the damaging effects of free radicals, guarding against heart disease and other health problems. Researchers at The University of Scranton in Pennsylvania analyzed polyphenol levels in two air-popped varieties and two microwave brands of popcorn. When they averaged the numbers from all four types, they found that roughly two tablespoons of unpopped kernels or three to five cups of popped popcorn (one serving) contains 300 milligrams (mg) of polyphenols, while one serving of fruit contains, on average, 160 mg. In other words, popcorn contains roughly twice the amount of polyphenols as fruit! And to get 300 mg of polyphenols from regular corn, which contains 114 mg per serving on average, you’d have to eat about two and one-half servings. Popcorn wins again—by a long shot! Then the researchers made another interesting discovery. They found that 98% of the polyphenols in popcorn are in the hull—the plasticky part in the middle of the popped piece of popcorn that often gets lodged in your teeth. “It makes sense, because we know that many polyphenols in fruits and vegetables are in the skin, and the hull is the kernel’s original outer coating—before the kernel pops and gets turned inside out,” said Joe Vinson, PhD, a professor of chemistry at the university and a coauthor of the study. One reason that popcorn has more polyphenols than many fruits and vegetables is because of its low water content, Dr. Vinson told me. “Polyphenols get diluted in fruits and vegetables because they contain about 90% water, but popcorn has only about 2% to 4% water,” he said. But there is one downside. The study also revealed that almost 100% of the polyphenols in popcorn aren’t “free,” meaning that they don’t automatically get absorbed into our bloodstream. “These polyphenols are bound to fiber, and fiber needs to be broken down and released by enzymes in the gastrointestinal tract,” said Dr. Vinson. (All fruits and veggies contain some “bound” polyphenols, but the percentage varies, he added.) In other words, it’s likely that some but not all of the polyphenol content in popcorn gets absorbed by our bodies. His next study, he said, will look at exactly how much does. In the meantime, Dr. Vinson said to chew your popcorn thoroughly, because enzymes in your saliva help break down fiber and make the polyphenols more easily absorbed. While dousing your popcorn with butter and salt may lower the glycemic index of the food, making it less likely to negatively affect your blood sugar and insulin levels, and won’t reduce the amount of polyphenols, it will raise the saturated fat, sodium and calorie content. If you overdo it, that’ll bring your popcorn down a few notches in the “healthy snack” department. Use an air popper and for a hint of flavor spritz popcorn with a light mist of water, lime juice or olive oil and then lightly salt it—the mist helps the salt stick and won’t make the popcorn soggy if you don’t overdo it. For non-GMO popcorn, visit http://www.amishcountrypopcorn.com/popcorn.html or search http://www.amazon.com.